1. Circle the New England colonies in blue. Circle the Middle Colonies in green. Circle the Southern colonies in red. 2. Using classroom resources, or other resources, make a list of the colonies in each region. 3. Label each colony on the map. Part B: Use a dictionary and the map to answer the questions. 4. Define "naval stores." Which region produced them? 5. Define "hides," as used on the map key. Which region produced them? 6. Infer what occupations were common in the New England colonies? 7. 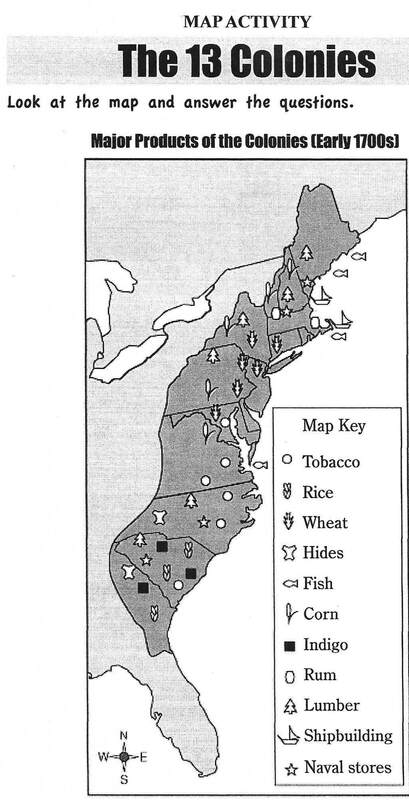 What products were most commonly grown in the Middle Colonies? 8. Which important "cash crop" grew in most of the Southern colonies? Describe a cash crop in your own words. Part D: Complete the activities. 9. What is indigo? Use online or classroom resources to research the product and its importance in colonial times. Create a computer presentation to present to the class. 10. Compare and contrast colonial products. Re-create the graphic organizer below. 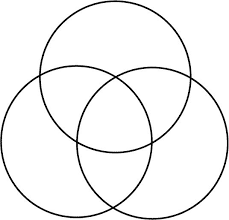 Label one circle for each of the three groups of colonies. Use the map and map key to complete the graphic organizer.